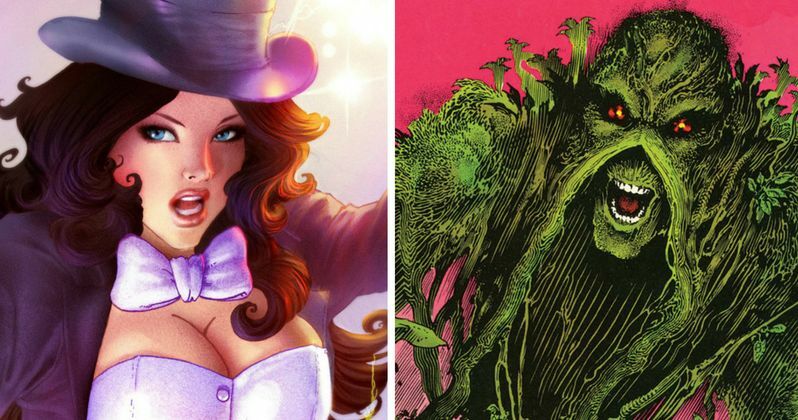 Will Constantine Introduce Zatanna and Swamp Thing? When Constantine premieres on NBC next Friday, it will join a growing number of shows based on DC Comics, including The CW's Arrow and The Flash and Fox's Gotham, with others like CBS' Supergirl in development. Like the previously-mentioned shows, Constantine will also introduce several other characters from the DC Comics universe, according to series creator/executive producer/showrunner David S. Goyer. In a new interview with Screen Rant, David S. Goyer teases that the writers and producers may bring Swamp Thing into the series, although it likely won't happen in Season 1, due to the complex nature of the special effects. "It's been thrown around. It's not something I think we'd attempt in the first season. We need to make sure that we can pull off the special makeup effects. We don't want to do a cheesy version of Swamp Thing. It's a lot easier to do Dr. Occult or Zatanna or Jim Corrigan than it is to do Swamp Thing. So we'll see." John Constantine often tangled with Swamp Thing in the Hellblazer comic books throughout the years, but it will certainly be tricky to bring a TV version of this visually complex character to the small screen. Speaking of Dr. Occult, Zantanna and Jim Corrigan, the executive producer teased that some of these characters and others from the Justice League Dark universe will be popping up during the first season. "Yeah. I think you'll see some of those. If the show takes off... even within the first 12 episodes we've introduced two or three characters from the broader DC universe that are not just exclusively from Hellblazer. Corrigan has been mentioned, but there's a couple of other characters we haven't talked about that will show up as well. If the show takes off and we get our back nine and come back for a second season, we sort of have access to that whole corner of the occult universe. So, hopefully we'll be introducing those characters as is appropriate." Given the number of DC Comics shows currently on the air, spread out through different networks, David S. Goyer was asked about an inter-network crossover event that brings all of these shows together. While it isn't being discussed at the moment, David S. Goyer isn't ruling it out completely. "You know, never say never. There aren't any immediate plans, but it would be interesting to try that, to do kind of an internetwork crossover. I think anything's possible. But we have to get our sea legs first. We've gotta premiere in a couple of weeks, and hopefully the audience likes what we've got and then we'll see." It should also be noted that film director Guillermo del Toro is developing a big screen version of Justice League Dark, currently entitled Dark Universe. The filmmaker revealed in August that he may be open to having Matt Ryan reprise his title role of Constantine for this feature, who will battle nefarious forces alongside other characters such as Swamp Thing, Deadman, Shade, Madame Xanadu, and Zatanna. That project remains in early development and wasn't announced as part of DC Comics overall movie plan released yesterday, so it remains unclear when that may get off the ground. Are you excited to see Swamp Thing on Constantine? Chime in with your thoughts below. Constantine debuts Friday, October 24 on NBC. Constantine Joining DC's Legends of Tomorrow Season 2?